Industry 4.0 has been a key topic in politics and economy for several years. The term refers to the networking of machines, production systems, people, companies and services with the aim of creating intelligent, self-organising and digital manufacturing processes – an approach that German medium-sized companies have only rarely implemented in full. The Berger Group specialises in the grinding and polishing of individual workpieces and metal tapes. With more than 250, mostly CNC-controlled grinding machines and almost 700 robot integrations, Berger has been dealing with the implementation of Industry 4.0 applications for years and is now one of the world's leading companies in its sector. In modern production processes, raw materials are provided by intelligent feed systems, such as driverless transportation systems or feed lines that supply unsorted workpieces with camera recognition. The production plants are subsequently automated with robots that either work in a separate cell or in cooperation with human workers. In general, the integration of a production machine could be described as follows (see picture 1 and 2). In digital, machine-controlled production, a manufacturing island includes one or several machines, the respective automation/feeding technology and magazines loaded with tools and/or workpieces. The plant is operated by an autarkic control unit. Once the control unit has processed and reduced the individual units' sensor and/or input signals using feature extraction, it will make decisions and/or trigger actions. These data are made available in the IoT so that they can be used by other production machines. Thanks to the interaction between the various machines, the available resources – i.e. the operating personnel, the raw materials and the tools – can be controlled and distributed in an ideal manner. Thus, it is possible to plan stoppage and setup times, while optimising the capacities and machining processes. 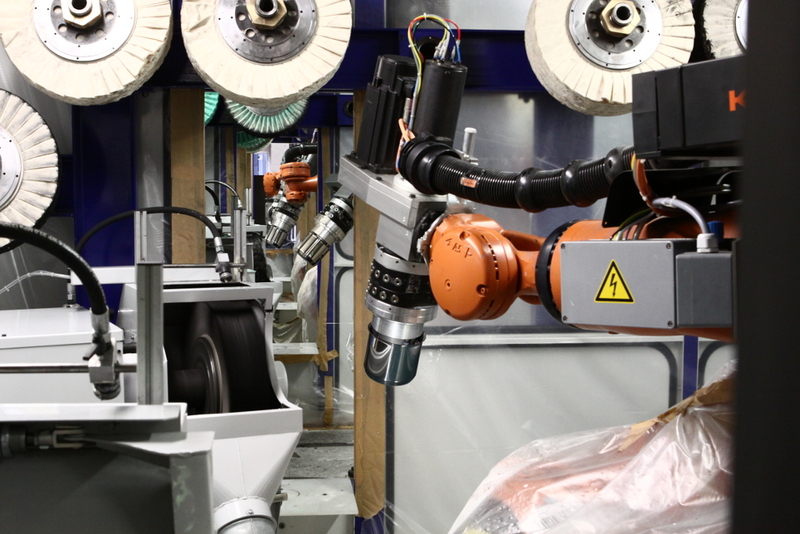 An example that illustrates this fundamental idea and Industry 4.0 application is a plant that uses four sequentially working robots for the automation of CNC grinding machines or, more specifically, the direct sharpening of knives. The following production steps take place within this manufacturing cell: material retrieval from a stacking magazine, grinding of the blunt edges, double-sided roughening of the main cutting edge with two CNC grinding machines, sharpening, removing, washing, drying, camera-based quality control and re-storage in a stacking magazine. Since the loading magazine is connected to a driverless transportation system, magazines loaded with blanks and finished parts are supplied and removed automatically. The basic concept of Industry 4.0 is perfectly reflected in this plant, because it is equipped with sensors that capture and process input signals relating to the plant status and then use the resulting data for decision-making. These decisions are visualised on a plant PC and forwarded to other production machines via a network. Not only does the driverless transportation system request the required raw material, but it can also report finished materials as being ready for pick-up. What is more, the system reports the current status of the tools and their scheduled operating time. A mobile app informs the employees responsible for production about the next scheduled machine stoppage. The request for raw material, tools and operating personnel ensures that the resources required for production are controlled in an intelligent and optimised way. The connected machines from other production sections communicate with each other in order to make best use of the available resources. Another example for a comprehensive Industry 4.0 application is a robotic system developed by Berger for the polishing of pots and pans. The robotic grinding and polishing plant consists of three production lines, each of which is equipped with eleven robot cells, i.e. 33 robots in total. It uses different manufacturing steps to process blanks into fully polished pots or pans. The whole process takes 10 s per line, i.e. 30 s in total. The plant includes a fully-automated tool and workpiece changing system and a matching polishing spindle. Besides automated tool wear monitoring, Berger has also developed an innovative control that positions high-pressure paste feeders in each cell. Moreover, the integration included an intelligent switch for ideal production line capacity utilisation including plausibility check and the complete networking of the individual cells. 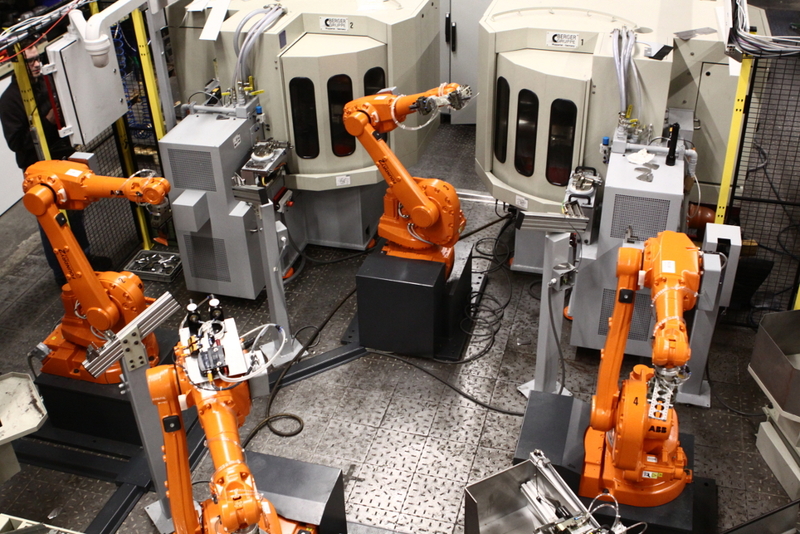 Using this technology, the entire plant – which is the size of a handball field – is able to complete a setup process, such as the changeover from a pot to a pan, entirely independently, without any interaction on the part of the operating personnel, within a stoppage time of less than 2.5 min in each of the 33 robot cells. A conveyor belt takes care of the workpieces' automated loading and unloading. This plant, too, has implemented the underlying concept of Industry 4.0: The status signals emitted from each robot cell are captured by the sensors and then processed individually in each cell using a decentralised control. This process is followed by the determination of actions and their communication to the other robot cells via a network. The system reports the current state of the tools and their scheduled operating time and monitors the functioning of the polishing and grinding units. Besides, the upstream robot cells provide it with information about the pot/pan to be processed so that a changeover process can be activated, if required. A central PC control informs the employees responsible for production about the next scheduled machine stoppage or the provision of tools. The control is connected to the IoT. Thus, the plant interface can be used to call up and visualise information at any of the networked IoT devices. In this case, the request for tools and operating personnel also ensures an intelligent and optimised management of the required production resources. Outside the automotive industry, this plant is one of the few production lines to have largely implemented the requirements of Industry 4.0. It makes digital, machine-controlled and cost-efficient production processes possible. 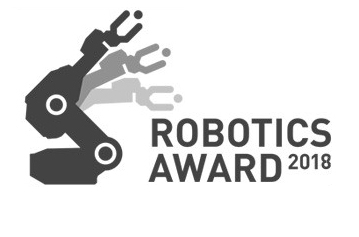 For this plant, the Berger Group received the Robotics Award 2018 at the Hannover Messe (Hanover Fair).